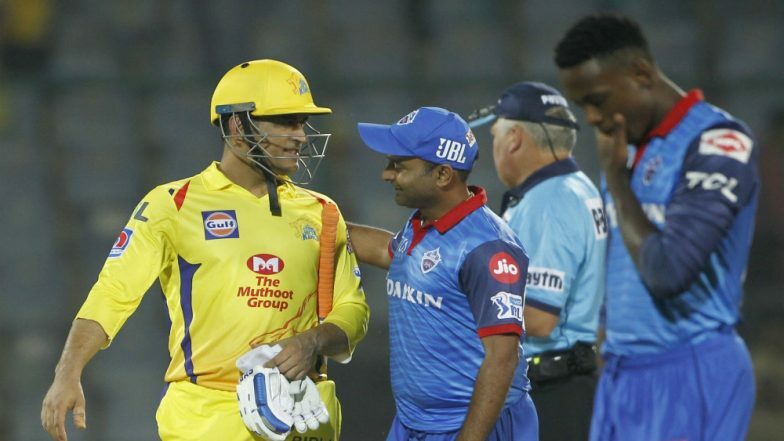 New Delhi, March 27: Mahendra Singh Dhoni might have lost the toss, but Chennai Super Kings used the conditions at the Ferozeshah Kotla beautifully as they beat Delhi Capitals by six wickets on Tuesday. If Dwayne Bravo (3/33) was the star with the ball, it was a combined effort bythe CSK top order as they chased down the target of 148 with two balls to spare. CSK beat DC by 6 wickets | Delhi Capitals vs Chennai Super Kings Live Cricket Score 5th T20 Match. The chase didn't start on expected lines for Chennai as they lost Ambati Rayudu (5) in the third over of the game as DC skipper Shreyas Iyer took an easy catch at mid-off off Ishant Sharma's bowling, but that was where the joy ended for Delhi as Shane Watson combined beautifully with Suresh Raina to take the attack to the DC bowlers. DC vs CSK, IPL 2019 Stat Highlights: Shane Watson Guides CSK Home, As Dwayne Bravo Snaps Three Wickets Against Delhi Capitals.